Purified Water, Glycerin, Potassium Sorbate, Citric Acid, Cetylpyridinium Chloride, Chlorophyll, Zinc Chloride, Green Tea Leaf Extract. Is this safe for cats too?We bought this product for our dog but we also have cats that drink from the same bowl don't wanna add it to the water until I know for sure this product is safe for cats as well. Hello and thank you for your inquiry. TropiClean does not recommend our Advanced Whitening Water Additive for cats due to their different ph level and potential for sensitivities. Our original formula Fresh Breath water additive is recommended for both dogs and cats 6 months and older. We hope this information helps! 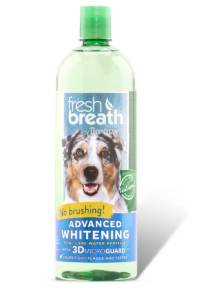 What makes it different?I love this Water Additive and it does wonders for my pets teeth. However, what is the difference from the Advanced Whiteing Water Additive vs the regular Tropiclean water additive except for the price jump? Tropiclean Oral Care Water Additive Ingredients: Purified Water, Glycerin, Potassium Sorbate, Citric Acid, Cetylpyridinium Chloride, Chlorophyll, Zinc Gluconate, Green Tea Leaf Extract. 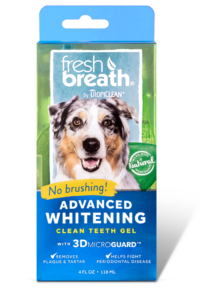 Tropiclean Advanced Whitening Water Additive Ingredients: Purified Water, Glycerin, Potassium Sorbate, Citric Acid, Cetylpyridinium Chloride, Chlorophyll, Zinc Chloride, Green Tea Leaf Extract. 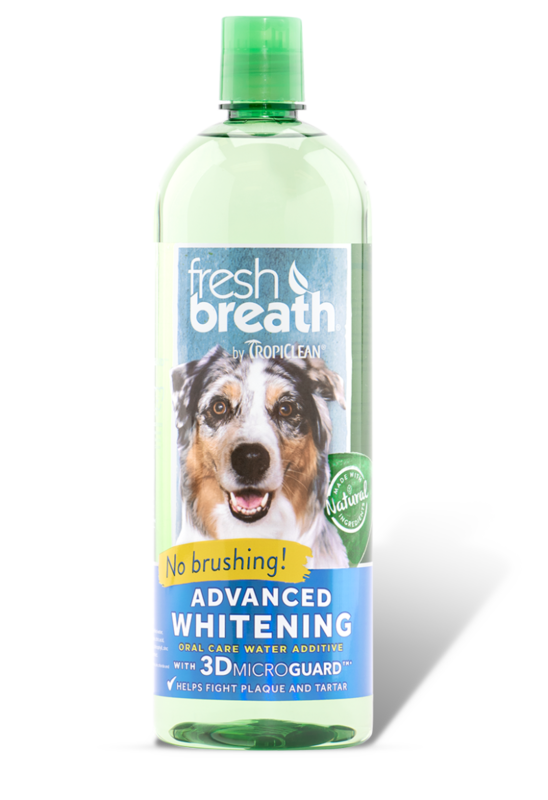 The ingredients are virtually identical except that the Advance Whitening Formula uses Zinc Chloride and the regular water additive uses Zinc Gluconate. Other than that, it’s idenical and in the exact same order. 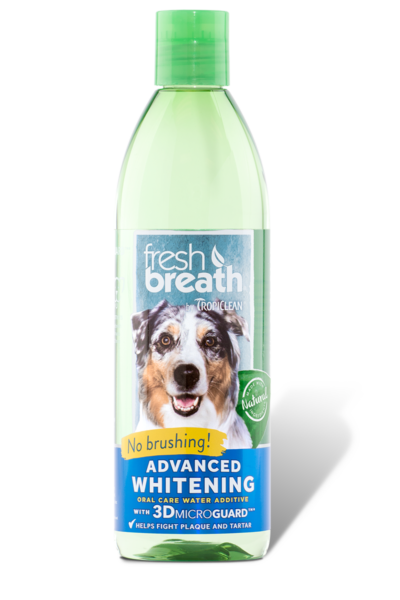 So what makes this product “Advanced Whiteing” vs the regular formula? Hello and thank you for your inquiry. 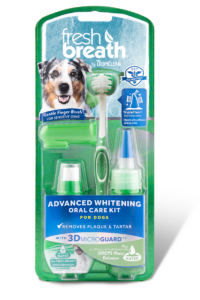 The variance in the ingredients as well as the concentration of the ingredients in the Advanced Whitening vs. the original formula are what constitutes the main differences in the products. We hope this information helps! Simply add on capful to your pet’s water bowl (approximately 16 oz) each time you refill it.